How amazing would it be to have one charging station for all your gadgets? Gone are those days when you would run around like a headless chicken in order to charge multiple devices at the same time. We will take you on a tour where you can have the best power strip with USB charging station. How to select the best power strip with USB charging station? How are you supposed to know what to buy and what not to buy when it comes to choosing the power strip? With a million options in the market, it is a pretty daunting task to pick one. You must consider the below-mentioned points before you buy a power strip with USB charging station for every gadget you own. 1. The power strips must be certified. Often people choose power strips that harm their devices and lead to so many hazards. Your power strip must have a certification from Underwriters Laboratory. There are instances when the power strip bursts and sets itself on fire. To avoid such a horrifying situation choose one that is certified. 2. What kind of power strip do you want? It comes in different forms. Corded hubs, organizers, and wall chargers. These power strips vary from one another depending on the place where you will be charging it. Wall Chargers. They go straight to your wall. These power strips have no cords and every device that you will connect will go straight to the boxes made. Corded Chargers. Similar to wall chargers but have a massive advantage. They come with a cord which enables the user to move it around. You can even plug it in a dingy room where the plug points don’t allow wall chargers. When your plug point is hidden by a piece of furniture then corded chargers can be used for plugging multiple devices and charging them with ease. Organizer style These power strips are heavier than the above two but come with multiple racks for your devices. 3. The next thing to consider is the number of ports your power strip has. Count the number of devices you currently own and choose a power strip that supports all and still has a few slots left for any future purchase. 4. The charging station’s amperage makes a huge difference. This decides how quickly and efficiently your devices will charge. Although you don’t need all ports with high amperage, you must choose one that has at least one port which will offer high amperage. 5. The warranty period also matters. So, make sure you consider that before buying a power strip with USB charging stations. We have prepared a list of products for you to choose from. Make sure you carefully take a look at each and every product. Want all your devices to charge at the same time and charge fast at the same time? Then, how about picking Anker to solve all your worries related to charging? One of the leading technologies of the world to charge your devices in an easy and safe way. The ability to turn into six outlets providing ample amount of room for every device makes it an attractive piece of the power strip. Charging all your gadgets at the same time has never been easier. Without the worry of damaging any of your appliances just charge them in a fast and safe way with Anker USB power strip.A choice of millions of happy customers all over the world can now become yours. The specifications that you must keep in mind are discussed at length.Go through every feature of this power strip before you choose to buy it.The dimensions of Anker power strip according to its length, width and height are 12.8*2.1*1.1 inches, respectively. It is light and weighs about 1.43 pounds. There are four USB charging ports for phones, laptops, home entertainment centres and so on. 6 Amperage charge flows through the power strip which evenly distributes 2.4 Amperage per port.Comes with a unique power expansion technique which turns one outlet into six. The outlets provide within the range of 100 – 240V of power. Anker Power Strip uses the technologies of voltage boost and fast-charging power IQ. Guaranteed safety from fire, short-circuit, surges and every other mishappening with 380J surge protection. Appliances are kept safe with circuit breakers of 15A. It has multi-protect safety system as well. Easy to use manual is provided for customers. Anker power strip can be hanged on the wall with its slots and it also has a rubber back to prevent it from sliding when kept on the floor.The cord of the Anker power strip is 5 feet in length. A total of eighteen months warranty is provided by the manufacturer on the Anker power strip. Charge every device in your house with Anker. The amazing feature of four USB ports that are built into this power strip. Charge your devices with 2.4 amperage current. It is safe and there are no chances of the power strip to burst into flames. Your devices will be protected from surge. Short-circuits, circuit problems or any form of hazard won’t be any problem anymore. The number of USB ports is not enough. The amperage on every port is the same which isn’t a good feature. Plug in all your devices at the same time and charge them hassle-free with TESSAN. A power strip that only ensures safety to its user’s devices. The problems of fire, overloading, the flow of excessive current to the devices and a short circuit will not steal your sleep anymore. Sleek and easy to fit into any bag or room makes it an eye candy. Learn the unique characteristics of TESSAN power strip, now. The total output of the power strip is 15 Watts. Technologies relating to intelligent charging is used. The devices that are plugged into this power strip are individually detected and the flow of charge varies accordingly. TESSAN power strip has been certified by FCC and RoHS. It is a high-quality power strip with fire resistant and resistance from heat features with ABS material. The integrated design in copper can endure conductance and heat dissipation. There are no issues related to loose plugging as TESSAN power strip can take up to 6000 pulls. The use of rubber on the bottom of TESSAN power strip helps it to stay steady while charging different devices. There is one outlet which transforms into two. The technology used to manufacture this power strip saves energy up to 85 percent and in return protects the environment.92*78*28 mm is the dimension of TESSAN power strip in length, width and height. The weight of the power strip is only 240.9 grams. It has as many as three USB ports for charging the different kinds of devices. The input of the USB port lies within 100-240V. The output of the power strip per USB port is 2.4 Amperage. TESSAN power strip goes one step ahead and uses LED indicators that help the user at night. 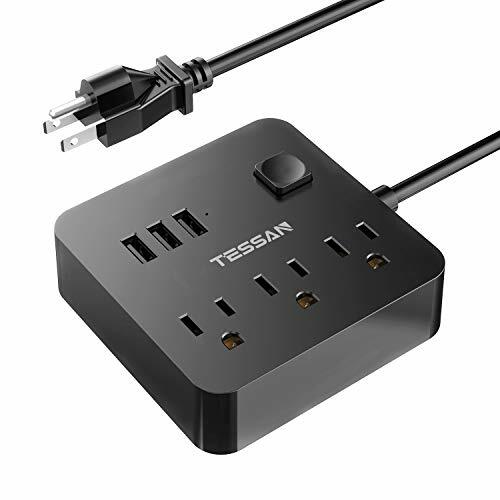 Design of the TESSAN power strip is extremely sleek and compact making it easier for the user to carry it around.The warranty period on this product is applicable for a period of eighteen months and comes with a cord of five feet. It is the ultimate power strip with two outlets. No matter which device you plug in for it will be safe with TESSAN power strip. The problems of overheating, short circuit, the flow of excessive current or overcharging won’t be something that will worry you. Charge three devices at the same time with its three USB ports. Each device will charge at 2.4 amperage which is pretty good. It is a friend of the environment and saves a lot of energy. Resistant to dust and can’t harm kids in any way. The number of devices that you can plug in is less. Every port has the same flow of current. The sleek design and powerful charging mechanism make it an extraordinary product. Embrace technology that has the ability to multifunction and provide you with every comfort you need. iClever with its outstanding performance and features can find a place in every home that has the need to charge its devices. Go through carefully the details of iClever and make a wise decision. The power rating of iClever power strip is 1250 W. Comes with three outlets. iClever power strip has 10 amps of security current. 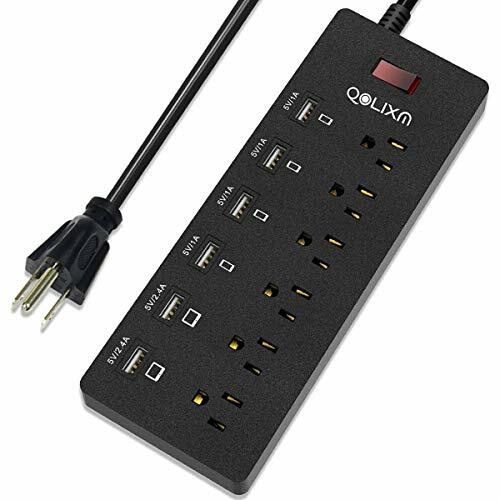 This power strip comes with individual switches to control the flow of current to USB ports on the power strip manually. Uses technology to break the flow of energy automatically when the transfer of current exceeds the limit. Devices that are plugged into the power strip will remain safe even when there is an outburst of fire, voltage fluctuations, excessive flow of current. It comes with a switch for overloading and can be used to reset and restore. iClever power strip has four USB ports for charging. The output of AC current in each USB port is 2.4 Amperage. The technology of smart ID recognizes the kind of devices that are put on charge using iClever power strip. It uses fire-resistant 94V0 material which can endure as much as 750 Celsius temperature. There is a gap in the middle of the iClever power strip to place the phone. This design enables the user to use the device with ease while it is charging. Dimensions in length, width and height of the iClever power strip respectively is 1.78*6.8*2 inches. The weight of the power strip is 2.1 pounds. iClever gives its user eighteen months warranty. Compact in design and has portability features which allows it to be carried around everywhere. The use of rubber on the back side of the iClever power strip allows it to remain steady while charging different devices. This power strip comes with as many as three outlets. Control the amperage with the individual switches that are present on it. It keeps your device safe. There are no risks related to fire, short-circuit, overflowing of current, sparks or any such thing. iClever comes with four USB ports and is made with the technology of smartID. It provides 2.4 amp rages for each device. Length of the cord isn’t satisfactory. This power strip will become your travel buddy once you go through the features of it. Apart from all the features that any power strip has, Poweradd 3 sends your way a few more improved and advanced features that are hard to find in other power strips. Get accustomed to the features of Poweradd. Two power strips one in white another in black find their place in Poweradd 3 combo pack. 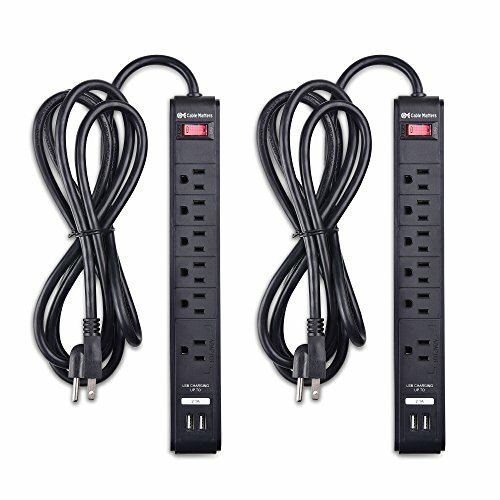 Be it any space or device, Poweradd 3 power strip is perfect and serves both the purposes. It can accommodate three devices on USB ports and three devices on AC. Fast and efficient charging is ensured with smart ID technology of the power strip. IT is made out of PC fire tolerant material and uses copper. Certification has been provided by FCC and RoHS. Performance of Poweradd 3 is guaranteed by superior quality. Protection against the surge, voltage fluctuations, overflow of current is provided in an advanced way. The warranty period on this power strip is of two years. Length of the cord of power strip is five feet. It has one USB port that renders 2.1 Amperage flow of current for tablets, iPads and different batteries. The other USB ports render a 1 Amperage flow of current and are best for MP3 players and smartphones. Maximum of 1250 W of power is supplied by the Poweradd 3. The voltage rating is 125V. The current rating is 10 Amperage. The dimension of the power strip is 9.45*4.57*3 inches in length, width and height. Perfect for entertainment centres, offices or when you’re travelling. It has a five feet long chord which enables charging even at places that are packed. Poweradd 3 comes with as many as three USB ports. It ensures safety for all your expensive devices. Keeps them away from harm. It has only one port for high amperage. Comes with only twenty-four months warranty period. The distinguished look and specifications of Safemore Power Strip help it rank among the top. Be the judge and choose Safemore power strip for the safety and efficient charging it provides. Let us talk about the detailed description of Safemore Power Strip. The possibility to charge multiple devices at the same time.It has as many as four ports for USB. The compact and tall design ensures a cleaner and easier to use the desk. Safemore power strips have the ability to charge every appliances, devices and adapter. The energy saving techniques of the power strip ensure easy to turn on and off methods. Safemore power strip uses LED indicators and provides convenience and safety during the night. It provides protection against fire with its fire resistant body. Protection is also provided against surges and short-circuits. The rating of power is 1250 W. 110V to 125V AC current is required as input. Five USB ports provide up to 2.1A of output. The length of the cord is 6.5 feet, which helps it to be placed anywhere and use it with ease. The power strip comes with one year warranty. 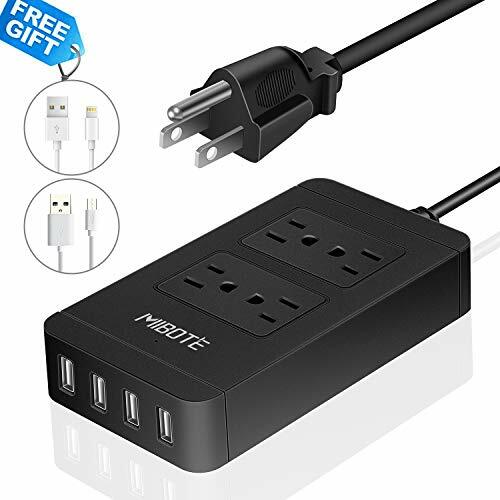 Safemore power strip has 9*5.9*6.6 inches dimension. The weight is 1.65 pounds, makes it easy to carry around. Charge as many as four devices with Safemore Power Strip. No matter what the device is, Safemore Power strip has the ability to charge it. It saves energy and comes with switches to turn off the flow of energy when not in use. The ability to keep your devices safe and away from harm’s way is another unique feature. It has the presence of LED lights which keeps the user aware even at night. Although the design is unique, it makes it quite difficult to carry it when you’re travelling. Select this product and charge all your products within the blink of your eye. Apart from its modern and sleek design, its features are eye-catching and it is a great choice for any place or person, who uses different devices or appliances. Before ordering BESTEK power strip learn about the features it has in stock for you. 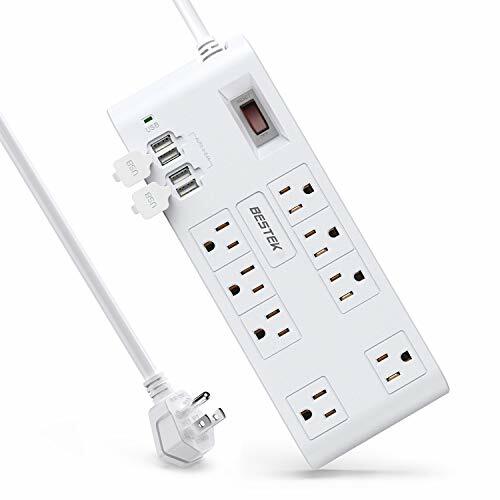 BESTEK power strip is 9*6.3*2 inches in length, width and height respectively. It is portable to carry around and easy to use. The weight of the power strip is only one pound. One outlet becomes two and provides easy access to all the devices that need to be charged. There are five USB ports for charging. BESTEK power strip surge protector comes with 1700 Joule surge protection and ensures 100 % safety against fire, fluctuating currents, short circuits, low voltage and other problems. The possibility to trip and fall is not going to happen as it comes with rubber base. Use of technology that can detect different devices is used. This enables the power strip to adjust the flow of output. The power strip charges all the device faster with its energy-saving techniques. There are no instances when the device has ended up losing its data or has undergone any form of damage. Resistant to dust and rust as well. BESTEK power strip has 1250 W capacity power. Each port gives 2.4 A of output while charging devices. It requires 100 – 240 V power. One year of warranty is provided to the user on BESTEK power strip. Cuts out the need for charging at multiple points. Plug in five devices in this power strip. The size and weight of the product make it easier to carry around and use at any place at any time. It is extremely safe to use this product. Bestek eliminates all problems related to the safety of the device that is plugged in it. The USB ports are designed in a way that it detects the devices that have been plugged into it and charges it accordingly. You have only one year warranty on this power strip. Despite its amazing features, that is really less. The list of places in your life that needs a good power strip and has the ability to charge multiple devices is what you need. Kinko will do just that. It has 1100W of power rating.It is the right time to throw away that old and unworthy power strip of yours. you have to bring home this amazing product that can fit into any space and accommodate any device. Adapters that are large to charging any device’s battery will be an easy piece of task for Kinkoo power strip. Often people worry about the kind of protection their devices are going to get when it is charging on a power strip. 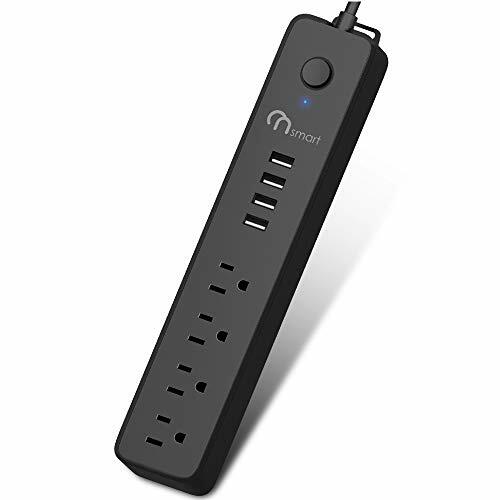 Coming with surge protectors this power strip is one which will keep your device safe when there is overflowing of current, short circuits, overheating or any such problem. Four USB charging ports along with three outlets make it one of kind. You must get acquainted with the many features of this particular power strip. Let us tell you the features of Kinkoo power strip, now. The weight of Kinkoo power strip is 12 ounces. It operates on AC-type of power. This USB charging station doesn’t work on batteries and doesn’t have any batteries. The measurement of the power strip in length, width and height respectively is 8*1.7*1.2 inches. 110V of voltage rating. 10 Amperage of current rating. The rating for surge protection is 180J. The range of Input AC for Kinkoo Power Strip is within the range of 100 to 240 V. Number of USB charger output is four. Three USB charging ports with 2.4A and one USB port with 3 Amperage charging. Three charging stations provide charging at a normal speed whereas the 3 Amperage port can charge at a high speed. The cord of the power strip is 1.8 metres long. This cord can be easily detached. Kinkoo Power Strip comes with eighteen months warranty period. Surge Protectors are another charm of USB charging ports. Consumer friendly and easy to use manual comes along with the power strip. It can be used in hostels, bedroom, offices and many other places where you need to charge your device. Kinkoo power strip is the best when it comes to travel, it is light in weight. This power strip has as many as three outlets and comes with four USB ports. The cord of the power strip is quite long and enables the user to stretch it far in order to charge the devices anywhere with ease. Use Kinkoo power strip without any worry for all your devices will be safe when you plug them into this. No quickly charge 2.0 or 3.0 port, but the USB 2.0 Ports outputs up to 2.4A is really enough for most charging needs. The dream of charging multiple devices at once will now come true when you choose hassle free and fast technology of charging every electronic device present in your home.